It is a truism among therapists in most mental health disciplines that the most important aspects of clinical practice are learned only after one has left graduate school and entered “the real world.” While many of the basics could be covered in graduate school, supervisors of new therapists often feel that the fundamentals are only addressed in detail after a therapist has been employed. 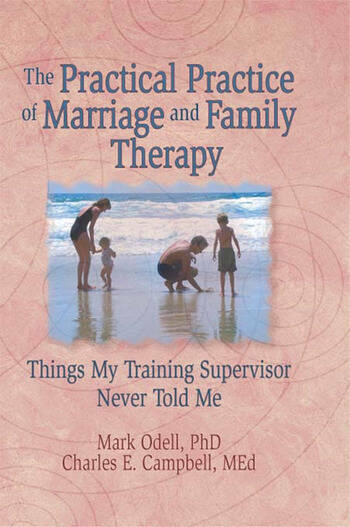 In response to this predicament, Odell and Campbell offer The Practical Practice of Marriage and Family Therapy: Things My Training Supervisor Never Told Me as a useful daily guide for graduate students and beginning marriage and family therapists that will ease the transition from learner to practicing professional in the clinical domain. Section I. Before You Get Started . . . So You Want to Be a Marriage and Family Therapist . . .
Case Formulation: So What Do I Do After the Intake? Documentation and Case Management: The Job Ain’t Done Till . . . Values Conflicts: Who Knows What Is Best for Whom?